Whether you’re looking for a heart-healthy dietary boost or a moisturizing hand salve, the solution is coconut oil. Its high concentration of healthy fats, remarkable moisturizing properties, and essential vitamins make it the perfect solution to just about every skincare, diet, personal hygiene, and health-related issue possible. Removing sticky labels and the gunk that comes with them can be tough, but there are so many adorable projects involving upcycled glass jars. What’s an eco-conscious DIY-er to do? Turn to coconut oil. When melted, the oil’s unique texture and chemical properties make it a perfect adhesive remover. Simply wash the jar with soap and water, wipe it dry, scrub with coconut oil, and voila! Now you’re ready to give that old jar or bottle new life. There’s nothing quite as annoying as a noisy door hinge. You can easily silence that squeak with a teaspoon or two of coconut oil. Open and close the door after dabbing oil on the squeaky hinge to work it through your hardware and find peace in your squeak-free home. With a quick rub of coconut oil, wooden furniture can look like new again. Combine the restoring coconut oil with vinegar and lemon juice to boost its cleaning power if necessary. Commercial bathroom cleaners can be costly when it comes to our wallets and our health. Take the natural route and form a paste of coconut oil and baking soda. This miracle mixture only takes ten minutes to work its magic on soap scum or mildew. Wipe clean with a towel and prepare for a sparkly shower. Crayons are a blast, but sometimes kids forget to color in the lines… and on the paper. If crayon coloring goes amiss, coconut oil will save the day! Rub coconut oil directly onto those tough-to-remove floor marks and see them lift away with ease. Go ahead and dance like no one’s watching. Coconut oil is the ultimate moisturizer, making it an easy choice to moisturize that dried out leather sofa. While it moisturizes, coconut oil’s antibacterial properties will get to work, leaving you with a clean and restored leather product. Stainless steel is a staple in modern home design and is a popular choice for appliances like dishwashers and ovens. You can keep these beauties from looking dull by rubbing a few teaspoons of coconut oil on their surfaces. Because cutting boards bear the grunt of our cooking endeavors, its important to maintain them properly. After disinfecting your wooden cutting board with vinegar and lemon, swipe on a layer of coconut oil for a moisturized and restored look. Using coconut oil when maintaining your wooden cutting board will naturally keep it clean and extend its life. Before you can cook the perfect steak in your new skillet, you must season your cast iron properly to create a slick cooking surface. The process involves covering the pan’s surface with a thin layer of oil and baking it in the oven. The best seasoning oil is – you guessed it – coconut oil! Pesky mosquitos can get in the way of your summertime patio bliss. Mix coconut oil with insect-repelling essential oils, like peppermint or tea tree oil, and apply it to your skin. The mixture can also be sprayed or dabbed onto outdoor furniture for a pest-free patio. Accidents happen, and gum can somehow wind up stuck in carpet fibers or tangled in hair. For an all-natural home remedy, grab your handy coconut oil and work it through the mess. Colds are no fun, but they can be tasty. Three simple ingredients that are probably already in your pantry combine to make a delicious, soothing lozenge with an antiviral kick. With this home remedy, you’ll quickly put your coughing days behind you. Natural eggs are coated in a protective layer that keeps out bad bacteria. Most store-bought eggs lack this coating, but you can recreate it by dipping room temperature eggs into melted coconut oil. Let the eggs dry and store them in a cool place. They can last months this way. Coconut oil makes a great natural carrier oil for homemade candles, enhancing the scent of whichever essential oil you choose. Armed with coconut oil, a quick trip to the craft store is all that stands between you and DIY aromatherapy. Combine lye, water, and essential oils to create your own non-toxic laundry soap. This detergent will clean your clothes spotless and proves to be an excellent choice for those with sensitive skin or harsh allergies. 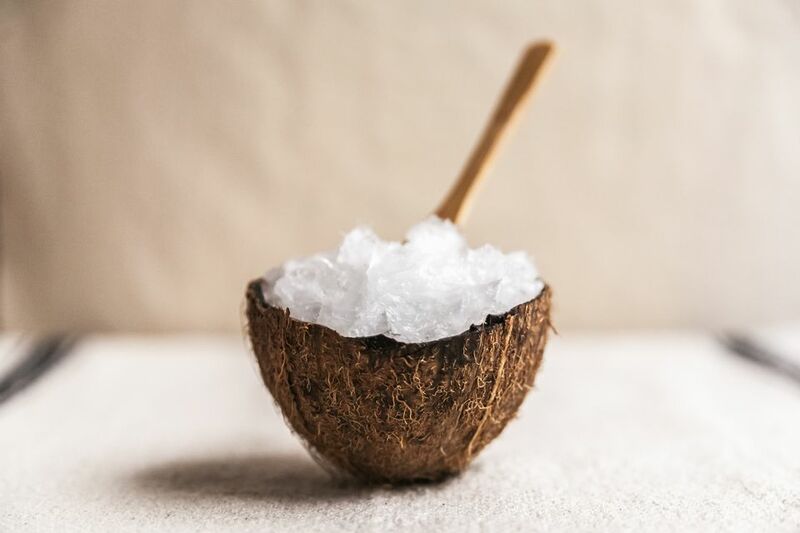 Improve your detox bath by tossing in a nourishing natural bath melt made by combining melted coconut oil with essential oil and cooling the mixture in an ice cube tray until solid. These are perfect moisturizers for those with dry or itchy skin. A thin layer of coconut oil wiped inside a plastic food container will keep away those unsavory food stains. You’ll never fear storing leftover lasagna again! Coconut oil, baking soda, and a few drops of peppermint essential oil combine to make a fresh-tasting mouthwash. The natural antibiotics found in coconut oil help rid of harmful mouth bacteria and prevent tooth decay. Rub a small amount of coconut oil on wooden or plastic surfaces around the house to prevent the buildup of dust. With this method, you can significantly extend the time between cleanings of that hard-to-reach ceiling fan. Most deodorants you find at the drugstore contain aluminum, which has been linked to Alzheimer’s disease and breast cancer. Forego this dangerous deodorant ingredient and go the all-natural route. Don’t worry, you’ll still smell fresh and clean. Just mix equal parts cornstarch and baking soda, then add a few tablespoons of coconut oil so the mixture will glide on smoothly. Whether you’re returning from a long road trip or simply parked under the wrong tree, coconut oil is for you. Slap some of this miracle oil on any stubborn sap or squashed bugs from your car hood, let it sit for a few minutes, and wipe clean with cloth. Who knew whipping up a batch of sweet-smelling, ultra-moisturizing soap was so easy? With this recipe, your visitors will never miss a chance to wash their hands.